London Studio’s PlayStation VR action adventure Blood & Truth has gone gold. The team announced the news on Twitter. Inspired by The London Heist, which is included in PlayStation VR Worlds, Blood & Truth is a cover-based shooter with a cinematic tone. In this game, you take on the role of Ryan Marks, a special forces soldier, who finds himself trying to save his family from a criminal overlord. You will be able to make dialogue choices throughout the adventure to determine the course of the story. Rather than a traditional shooter, in which you’re both moving and shooting at the same time, London Studio approached gunplay in a different way, in order to better accommodate that come from playing a game in VR. Instead, it implemented a system in which you’re moving from place to place with movement transitions. It seems similar to light gun shooter titles like Time Crisis and Ghost Squad. The system worked very well and allowed me to take out the bad guys safely while staying in cover and popping out to shoot. Movement transitions were very smooth and gave the game military like precision when it came to advancing on the enemy. London Studio even asked for advice from an SAS soldier while they developed the gunplay for Blood & Truth. He also provided insight into how soldiers speak in the field and even was given a role in the game. 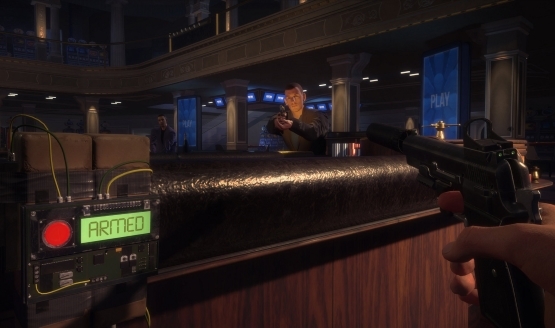 Blood & Truth is a pretty lengthy PlayStation VR title, with over seven hours of playtime. Based on his first impressions, Edwards thought that it has “excellent graphics and some seriously fun gunplay.” The game will release on May 28th, 2019. It’s available for preorder on Amazon, if you are willing to take on this mission.